If Judd Apatow were a snack food, he would be Beer Nuts. Like that bar favorite, the comedy style now synonymous with Apatow's name is a delicate balance of salty yet sweet. 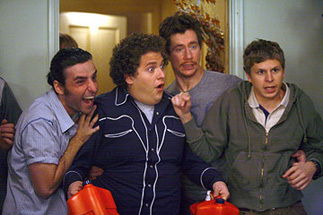 And Superbad, the latest movie from 2007's comedy Svengali, is the Beer Nuttiest of them all. With language so salty, it makes 40 Year-Old Virgin look like Newsies, and a sweeter heart than Knocked Up, Superbad is not just the funniest movie of the year - it's also one of the flat-out best. Man, though, these kids can cuss. Jonah Hill went from wanting us to ask about his wiener in Accepted, to not shutting up about it here. He plays Seth, a chubby motor-mouthed fountain of profanity, hurling expletives in all directions, as if they were a shield protecting his many insecurities. His best bud is Evan (Michael Cera from Arrested Development), the sweater-wearing level-headed half of the duo. Evan is like an 18-year-old Bob Newhart, constantly marveling at the craziness swirling around him, trying to keep things on course with clear thinking and a sturdy conscience. Several critics have compared this pair's chemistry and dynamics to some of the classic comedic duos, like Laurel and Hardy or Abbott and Costello. I would say they're more analogous to Lethal Weapon's Mel Gibson and Danny Glover. Hill is like Gibson's Riggs - a little crazy and unpredictable, the "loose cannon." Cera then, is the Murtaugh character - a straight-shooter who usually plays by the rules, but can be persuaded to bend them if the situation calls for it. Superbad even has its own version of Leo Getz, the annoying jabberjaw played by Joe Pesci in Lethal Weapon 2. His name is Fogell, aka McLovin. Ah, McLovin - seller of tickets, creator of catchphrases. As played by casting call find Christopher Mintz-Plasse, McLovin, an uber-nerd so dorky that he comes all the way back around to cool, manages to act as comic relief in a film that doesn't require any. Superbad would already have a dizzying amount of laughs without him, but with McLovin, this one goes to 11. He has the manic, nerdy energy that DJ Qualls brought to Road Trip, but even more so. He's like the character in a sitcom that the audience goes crazy for every time they enter a scene. Mintz-Plasse has a lifetime of "Hey! McLovin!" to look forward to/dread, and I don't think you can overestimate how much of the film's popularity he is personally responsible for. Which is not to say that our main two characters aren't terrific. Most of the sweetness of Superbad comes from how these two best friends interact, and how they attempt to forget that this is summer's last hurrah, before they are forced to go their separate ways to new colleges. Being teenage boys, they can't seem to communicate their affection for each other, lest they come off "gay." Instead, their anxieties mostly take the form of arguing and cursing. Much of the action centers around their attempts to procure alcohol for some girls at a party, possibly get laid, and enjoy one another's company while there's still time.